2/01/2019 · Six character underglaze Guangxu mark. The piece is in very good condition besides that drill on the bottom. Not sure how to tell if it is from the period, later or much later.... An intricately carved jade vase with a “very pale” celadon colour soared past its $40,000-to-$60,000 estimate to sell for $816,000 at a Maynards auction in Vancouver on Wednesday. Ming Longquan Imperial wares . The Ming official records, Da Ming Huidian (大明会典) recorded instances of the Palace ordering Raozhou (饶州) ie Jingdezhen and Chuzhou (处州) to produce porcelain wares for use by Palace and for ritual and overseas tribute purposes.... Chinese Antique Celadon Blue & White Porcelain Vase Jar - 19th - Century. An antique Chinese celadonblue and white porcelain vase jar - 19th century qing dynasty. An antique Chinese celadonblue and white porcelain vase jar - 19th century qing dynasty. Chinese Antique Celadon Blue & White Porcelain Vase Jar - 19th - Century. An antique Chinese celadonblue and white porcelain vase jar - 19th century qing dynasty. An antique Chinese celadonblue and white porcelain vase jar - 19th century qing dynasty. how to watch region restricted videos The beauty of a Chinese vase is revered for ages. Chinese vases with Celadon, Flambe and blue and white glazes are a collector's delight. Buying Ming vases or Kangxi vases are dreams of many. Learn more about the extensive designs of these pieces before you collect Chinese meiping, huluping or cong vases. Blue and white Chinese vase, marked made in China on base, 24 x 80cm high Open daily from 9.30am A visit to Grace Galleries is a voyage of discovery ANTIQUES, ART and BEAUTIFUL OBJECTS We are located in the Runaway Bay Antique & Arts Centre building. A larger vase of this type in the Palace Museum, Beijing, is illustrated in Longquan qingci, Beijing, 1966, pl. 41; and vases with their mouths reduced, in the Topkapi Saray Museum, Istanbul, are published in Regina Krahl, Chinese Ceramics in the Topkapi Saray Museum, vol. 1, London, 1986, nos 204 and 205. 12/01/2019 · Chinese, 20th century. 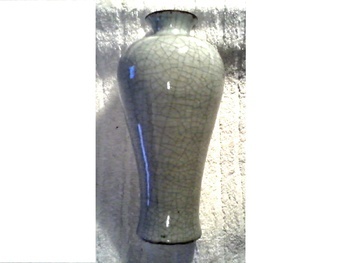 A small pale celadon vase with dragon motif. Unmarked. Approx. h. 4.625". Chinese Pottery During the Ming Dynasty (1368-1644) The last of the great four Chinese dynasties, the Ming era coincided with the European Renaissance and, as in Europe, it witnessed an upsurge in architecture, the arts and above all ceramic art.